Well, it's official. We pulled up to the house today (to start our radon tests) and the for sale sign no longer says "for sale"....it says "SOLD"!!!! We were pretty excited. We rented a storage unit in Stephens City right up the road from the house. We packed up the SUV with as much stuff as we could, filled a friend's truck with a bunch of stuff and headed out to Stephens City this morning to start filling up our 5ft x 10ft storage unit. We figure over the next couple of weeks we will be able to move a good amount of our stuff so that on moving day we will only be left with the big furniture but we shall see if that all works out. After packing up the storage unit, we headed over to the house to start the radon tests we had bought. The tests will collect a reading over the next few days before we have to send them back to the lab. After that was all set up we headed out for lunch. We decided to try out "IJ Cannes" an American Grille restaurant in Stephens City/Winchester. The food was pretty good, I had a burger and Ben had a BBQ beef sandwich. Shenandoah Chocolate shop sits close by the restaurant so we walked over to check it out. Yummy. The people at the restaurant and the chocolate shop were so nice. The owners of the chocolate shop talked with us and gave us information about the area and even told us about some spot in Washington National Park that only the locals know about. We are both very happy to be moving out that way. It seems like the people are a lot friendlier and that there is more of a neighborhood-like feeling. This past weekend we had "purchased" our home inspection! Whoo hoo! Having a home inspection is not necessary, but highly recommended. We thought that an inspection was very important when making such a big purchase and would highly suggest anyone buying a home have an inspection as well. The inspector was very nice and very thorough. He checked every single outlet and every nook and cranny of the house. Luckily the house "passed" the inspection. There isn't any big problems that need fixing, just a lot of little things. When the old owners were foreclosed on, they took just about all of the lighting fixtures and left the wires hanging out of the ceiling. So, we have to either cap off the hole or install a lighting fixture. They left wires hanging out of the back outside wall that went to a hot tub or sauna, so those will also need to be covered. In order to pass FHA assessment we have to fix these minor issues before closing. I just posted this entry not but 1 hour ago and I received a phone call from our realtor with the good news that the appraiser from FHA went through the home today and gave no restrictions for passing FHA regulations! So that means that, although we are going to cover the lighting fixture holes, we do not have any time constraints in which to complete that task. Yesterday evening Ben and I made our first big purchase for the house. A Washer and Dryer....I know, we're livin' on the edge. We purchased a Maytag Bravos set after much research and debate. I decided from the beginning that I did not want a front load washer based on the reviews and reports I read on them. Coincidentally, LG front load washers now have a warning on them stating that they are not intended for use on a second or third floor. The vibrations are so bad that they need to be set on a concrete (basement) floor. I also read that front load washers are increasingly having issues with mold. And supposedly retailers are supposed to warn you of this problem and suggest that you wipe out your machine after every use.....definitely not for me. Besides, the laundry room at the house is not in the basement so that pretty much determined my decision from the beginning. 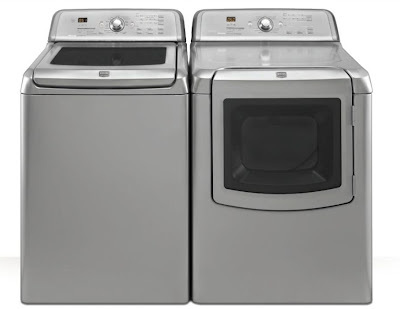 So we decided on the Maytag set you see in the picture above (but we went with the white color because it costs less than the colored washers and dryers...go figure). The washer is HE and both the washer and the dryer are Energy Star qualified. We are very excited and hope that we like them. Unfortunately there really isn't one washer out there that people/reviews agree on being the best bet. So we are hoping that we will have a good review of the washer. The idea is pretty neat with this washing machine. It doesn't have a central agitator thus giving it more room (4.7 cu ft!). Along with our purchase, we got 3 years of Tide for free (something like $250 worth), a $100 mastercard gift card, and a rebate for free delivery. Plus the appliances were all 10% off. So good deal. The set is due to be delivered on our closing date (March 20th). I will post my review after I get to use them!!! Here are some pictures I have taken at the new house! We are very excited and can't wait to move in! Yesterday we met with our mortgage broker and locked in a rate of 4.5% fixed so we are very happy. We have our home inspection this weekend. Hopefully everything will be up to code and in good condition. We have our fingers crossed. And of course I will let everyone know how it goes. I am so excited right now I can't type long but......Ben and I put an offer on a house and it was just accepted today after a month and a half wait!!!!! So anyone who wants to come visit after March 20th (our close date) we will have plenty of room! Ben and I went and got ourselves sucked into the vortex of what some may call a gimmicky product. We bought a Peticure. The Peticure is a nail file for your pet. It claims that instead of using a typical nail trimmer, that causes pressure and breaking of the nail, the Peticure gently files the nail down. The store we buy Aida's food at (Wylie Wagg) just had gotten them back in stock and were almost out again so we decided to pick one up. They said that the peticure works really well so we figured we'd give it a shot. The Peticure claims that you have to first introduce the product to your dog over a several day period. You need to have "positive treats" ready so your dog associates the peticure with good things. We are currently in that "introduction" period and will hopefully be able to successfully file Aida's nails soon. Last night around 7 pm, I walked into the kitchen to do the dishes and noticed a smell. It smelled like a gas burner on the stove top had been left on without the flame lit. So obviously concerned, I called Ben in. He agreed that there was definitely a smell, but wasn't convinced it was from the stove top. Ben pulled the stove out, turned off the gas, opened the window and turned on the exhaust fan. I did the dishes and then headed into the bedroom where the smell about knocked me down. Confused as to where the smell was actually coming from, Ben and I walked around sniffing everywhere as if we suddenly joined the canine species. Surprisingly, our master bathroom smelled the strongest. So we opened the windows and turned on the fan. Mind you it is in the low 20s outside. We called the emergency maintenance number. We didn't want to call 911 because we weren't sure that it was gas from the stove. The maintenance guy came in and was like, "Whoa! It really does smell in here!" Duh. So after he searched around he found a garage that had a car that really really smelled strongly of gasoline. The strange thing was, the garages are not directly below our apartment and moreover, the car was not leaking. After going back and forth, the maintenance guy could not determine the owner of the vehicle and so he called 911. With sirens blazing the firetruck showed up along with the shift commander. It was hilarious to see the people "rubber-necking" out of their windows and driving by very slowly. One woman was on the 3rd floor across the way and had her blinds pulled all the way up and her window open so she could hear what was going on! They checked out our apartment, as well as the other apartments in our building. They broke into one garage to check another car, and somehow got inside the stinky car. They could not find a leak but were pretty sure that that car was the culprit. So the Sheriffs Department was called to determine the ownership of the vehicle to have it moved and further investigate the stench. They couldn't figure it out. The plates were from California so I don't know if that was part of the problem. So the firefighters said they were going to leave the garage door open and if the smell got worse in our apartment, we were to call them back and they would tow the vehicle. Luckily, the smell seemed to dissipate and there was only a slight hint of the smell this morning. So hopefully, they will find the owner today and get the situation resolved. Otherwise we may be calling our good ol' friends at the fire department again this evening.